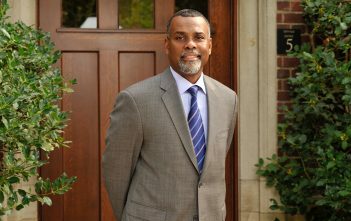 Eddie S. Glaude Jr. joined the faculty in 2002. He is the author of Exodus! Religion, Race, and Nation in Early 19th Century Black America, University of Chicago Press, In a Shade of Blue: Pragmatism and the Politics of Black America, University of Chicago Press (2007), Democracy in Black: How Race Still Enslaves the American Soul, Crown Publishing (2016), African American Religion: A Very Short Introduction, (2016) Oxford University Press, An Uncommon Faith: A Pragmatic Approach to the Study of African American Religion, University of Georgia Press (2018), and editor of Is it Nation Time? Contemporary Essays on Black Power and Black Nationalism, University of Chicago Press (2001). Professor Glaude co- edited “African-American Religious Thought: An Anthology,” (2004) with Cornel West. His research interests include American pragmatism, specifically the work of John Dewey, and African American religious history and its place in American public life.